So here I am in Italy having an amazing time. I wake up, eat a fab breakfast, go for a 3hr bike ride that usually includes at least one doppio espresso macchiato and then return to our gorgeous resort-Borgo San Felice. A short bike ride somewhere for a 3hr lunch of caprese salad and a pici pasta and then back for a rest by the beautiful pool. In the evening – if Jim Cuddy isn’t leading us through a wine tasting we go for more delicious food and local Chianti region wines. After dinner Jim, his son’s Devin and Sam and/or Barney Bentall jam at the hotel bar piano. It’s almost too much dolce vita… but then I don’t think there can ever be too much of that! I’m so so lucky. Chandra spoke about really focusing on the positive thoughts in her head even when they seem to be only a whisper compared to the negative ones. She enchanted the group and concluded by showing her Olympic Gold medal. Curt was next. In the interview format of the evening, where I had the privilege of asking the questions, we went through the tactics of match sprint cycling. This cat and mouse event, where the cyclists move from almost a crawl to 60+kpm’s in an instant, has always fascinated me. Curt went on to tell the group that as much as we’d like to fill our careers with just success we all know that isn’t always possible. He explained how losing a race because of a failed tactic actually allowed him to win one of his 3 Olympic medals. FAILURE he said simply stood for Found Another Important Lesson Under Review of the Experience. Like Chandra, Curt also had his medals to share with the group. I didn’t have my medals. I had been a bit worried about not being able to bring them with me because they are on display in Calgary at Canada’s Sport Hall of Fame. Instead I brought something else to share and it was so NOT glam like medals!!! 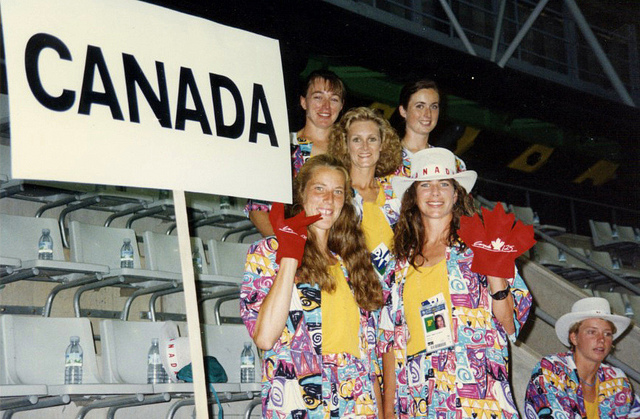 I brought a piece of clothing from the 1992 Barcelona Opening Ceremonies uniform that the Canadian team wore. It’s horrendous and yet it was an iconic part of my first Olympic Experience – my Canadian Team uniform for the Olympic Opening Ceremony. My point with bringing the jacket and the story I told was to highlight remembering keeping your eye on the prize – the thing that is really important to you. Often we think that at a certain level everything is going to go smoothly, that when we reach that ‘next’ plateau all the T’s will be naturally crossed and the I’s will be easily dotted – but rarely does that seem to happen. The colourful jacket that I modeled to the group at San Felice reminds me that it wasn’t the uniform or any Olympic ‘perk’ that was important to me. The uniform was not why I had worked so hard. What was important was that I arrived in Barcelona for the Olympics ready. We had done the work and were prepared to perform. That terrible uniform reminds me that what I’m proud about isn’t HAVING a medal but the PROCESS of winning the medal. Without question I love sharing my medals with people (that’s why I’ve lent them to the Hall of Fame) but my preparation, ability and sense of confidence will always be just mine. It’s how we handle our journey; staying positive when it’s a struggle- as Chandra suggested and learning from success and failure as- Curt reminded us that gives us our swagger. Discarding the flotsam and jetsam of the journey and maintaining a simple focus on our goal is often what makes us feel so great. 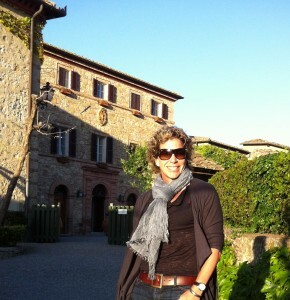 This entry was posted in Marnie's Adventures and tagged Chandra Crawford, Curt Harnett, Cycling, Tuscany by Marnie. Bookmark the permalink.